Dentures are replacements for missing teeth. Complete dentures replace all teeth and removable partial dentures replace some teeth. By matching each individual’s unique smile and bite, dentures can improve facial appearance and self-confidence. Dentures may also improve speech problems caused by missing teeth and will improve chewing. No dentist is more qualified to deliver a denture at a higher quality than a prosthodontist, like Dr. Tyler. The only formal education and training available regarding the history, techniques, literature/research, and clinical experience for expert-level denture techniques are found in advanced dental specialty residency programs. The most highly trained dentists with respect to this type of treatment are prosthodontists. Complete dentures are the most affordable way of replacing all your missing teeth. It is a removable prosthesis made of an esthetic plastic material (acrylic resin) forming both gums and denture teeth. They tend to cover the entire roof of the mouth to provide stability and can be very esthetically pleasing since they look very natural. However, it is important to keep in mind that dentures are not meant to be worn 24 hours a day, your prosthodontist will recommend taking them out at night. The use of dental implants may increase the stability of your complete denture (implant-retained dentures). The most common type of denture. This one involves having all teeth removed for 8 to 12 weeks prior to beginning fabrication. This type of denture is prefabricated prior to the teeth being extracted. This way, they can be delivered on the same day your remaining teeth are removed. A soft reline material called tissue conditioner is used to adapt this denture to your jaw during the 8 to 12 week healing period. After healing is completed, a final hard reline is completed. This type utilizes underlying existing teeth or dental implants to increase stability and retention. The use of a denture attachment apparatus is often used. When you lose even a single tooth, it is important to replace it since it will cause the rest of your teeth to shift into the empty space. This will cause esthetic problems, as well as lead to tooth decay since crowded teeth are harder to clean. 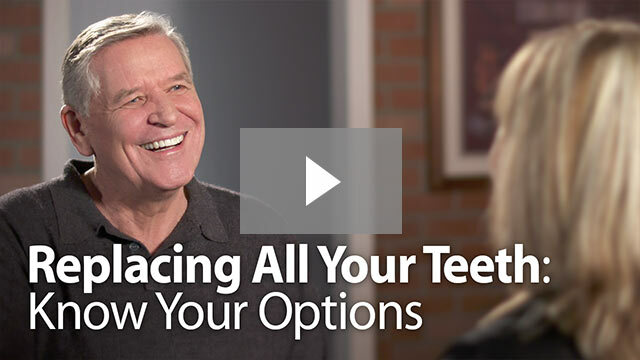 For patients missing several teeth, but not all of their teeth, a removable partial denture may be an affordable option. This type of denture uses the remaining teeth to hold or anchor the removable bridge in place. Unlike implant-supported crowns, implant-supported bridges, and fixed dental bridges, removable partial dentures are not meant to be worn 24 hours a day and must be taken out at night. There are many different types of and designs for removable partial dentures. Typically, a removable partial denture is made of a metal framework with an esthetic plastic material (acrylic resin) forming both gums and denture teeth. The number of missing teeth and their location will affect the comfort and stability of the removable partial denture. They are designed to offer a patient proper dental function, allowing them to eat while the denture is in. The use of dental implants may increase the stability of your removable partial denture (implant-retained dentures). New dentures may feel odd or uncomfortable for the first few weeks. This is normal. Commit to wearing them consistently to get used to them. The lower complete denture may feel especially loose until the muscles in your cheeks and tongue learn to hold them in place. Dental implants can help eliminate this learning process by holding the denture in place for you. You may have extra saliva for a short time. Some soreness should be expected for the first week or two. Your prosthodontist will check your progress and make any adjustments necessary to make you more comfortable. Begin by eating soft foods cut into small pieces. Chew on both sides of the mouth to keep the pressures even. Do not eat very sticky or hard foods or chew gum. You will also need to practice talking with your new dentures. Try reading out loud and repeating tricky words in front of a mirror. Talk slowly to prevent muffled speech. If your dentures slip out of place when you laugh, cough, or smile, bite down and swallow to reposition them. Your new dentures should fit securely, but denture adhesive may be helpful as you get used to wearing them. A denture that does not fit well can cause irritation, mouth sores and infection. While denture adhesive may help a loose-fitting denture for a short time, using adhesive all the time is not recommended. If your denture is loose, have it checked by a prosthodontist. Dental implants should be considered if you feel like you can’t go without denture adhesive. The normal lifetime of dentures is 5 to 10 years, but this can vary widely depending on the patient. Overtime, dentures can break, crack, chip, or start to feel loose. The prostheses may need repaired, relined, or rebased. Repairs to fix breaks, cracks, or chips to the denture base or teeth can often be made easily. Relining is when new material is added to the underside of the denture base to fit to your gums. Rebasing is when a new base is made while still using the existing teeth. Relines and rebases should result in a more accurate fit. The mouth changes naturally with age. Jaws line up differently as bones and gum ridges recede and shrink. At some point your dentures will be worn or no longer fit well and will have to be remade. It is important to replace worn or ill-fitting dentures before they cause problems. Your prosthodontist will let you know when it is time to replace your dentures. It is important to keep in mind that dentures are not meant to be worn 24 hours a day, your prosthodontist will recommend taking them out at night. The tissues that are covered with denture material all the time can become irritated or even infected (often a painful fungal infection called candidiasis). Like natural teeth, you must take good care of dentures. Make sure to clean them on a daily basis to avoid accumulation of food particles and plaque. When brushing them avoid the use of toothpaste because most toothpastes contain abrasive particles. Liquid hand soap is a good alternative. Keep them in water or a denture soaking solution when not wearing them so they do not dry out. Rinse them very well after using any denture cleanser because it may contain chemicals that should not go in the mouth. If you have a removable partial denture, take extra care of your remaining natural teeth, especially the teeth that fit under the denture’s metal clasps. Brush twice a day and floss once a day. In addition, make regular visits to your registered dental hygienist for professional cleanings or periodontal maintenance. How do I care for my mouth if I have no teeth? Even if you wear full dentures, you still must take good care of your mouth. Brush your gums, tongue and palate every morning before putting in your denture. This increases circulation in your tissues and helps remove plaque. You will still need professional dental hygiene visits at least once per year. During a visit, your dentist will look for signs of disease such as cancer of the head and neck. They will also check the fit of your dentures, clean them, and make adjustments if necessary. For any further questions about dentures please do not hesitate to ask us.